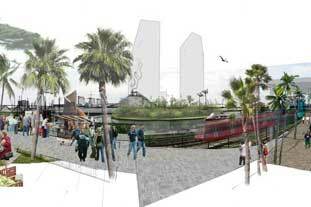 The London Thames Gateway Development Corporation has shortlisted five firms to design the Lea River Park. The two-mile Lea River Park will connect the Olympic Park to the Thames at the East India Dock Basin. They will work in partnership with Design for London and the Lee Valley Regional Park Authority. An LTGDC representative said detailed designs would only be drawn up once a firm had been appointed - by the end of this year. She added: “Our view is that the firms’ designs and plans should be based on really close working with the client and consultation with local communities in the area. Over 30 submissions were evaluated by a team led by LTGDC including Design for London, the Lee Valley Regional Park and project manager, Drivers Jonas.